[By Nick, limited time only] Last night, my girlfriend and I went to the semi-new Burger 21 that opened up in Latham late last year. They have around 15 stores throughout the country with Latham's being the first in NY. Honestly, I drove by it a few times after it was built but never really looked into it. After my experience last night, I know I'll be back. Nick Note: I need to take more pictures of the actual restaurant next time I'm there. 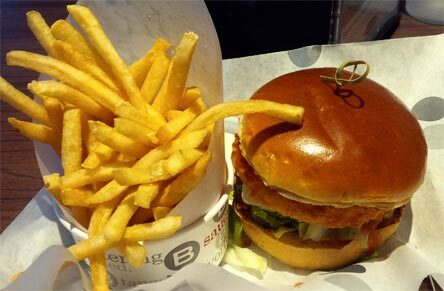 First off, their buffalo chicken burger was delicious. Perfectly spiced, ample amount of bleu cheese crumbles and they didn't mess up my order like other places do and made sure to leave the ranch off. The fries are pretty good as well. I don't really eat french fries often but these reminded me of the McDonald's fries of my childhood, just a bit crisper. Salty but not overly so and you can taste the potato perfectly. These fries don't even need any condiments but they have something like 10 different sauces at your disposal. Including a "toasted marshmallow" flavor which I decided to sample as I was leaving. That was a bad idea, it tasted so much like ranch and I'm obviously not a fan of such sauce. Still, I'll need to sample more sauces on my next trip. Now this is On Second Scoop, so you know ice cream has to be involved. Burger 21 also specializes in shakes and the current limited edition which apparently was only available until last night (it got replaced by a s'mores shake according to their twitter that I'll go back to review as well) sounded too enticing to pass up. How could I say no to that? It sounds like they're not messing around either. The store is making their own ice cream (or so it sounds like) and using some higher quality caramel. The shake itself is just pretty. Look at it, just do it. The execution is spot on in appearance. The disk of baklava is beautiful as well. I mean, its just so round and basically a perfect circle. 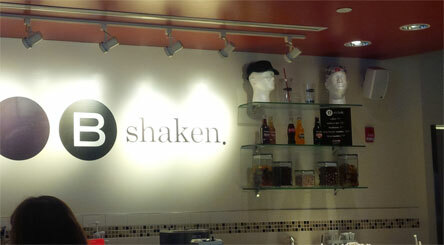 The shake itself is thick and a lot richer than I was expecting from a fast casual restaurant. This is up there as one of the highest quality milkshakes I've had in my life. The vanilla ice cream is standard in flavor and gives way to the caramel and toffee sauce taking over. The shake basically tastes like a heath bar dipped in a sweet, buttery caramel sauce. Aka, this shake is delicious. The baklava disk was just as delicious as the shake. We used it as a mini scoop so we got some shake with each bite of the disk. The disk on its own is slightly flaky but crispy and crunchy at the same time. I can't say I've had baklava** in my life but this was a great introduction. The taste of cinnamon was the strongest followed by some sweet caramel notes. Only thing I wish was different about this shake was if they blended some of the baklava in the shake. Outside of that disk, this is essentially a caramel toffee shake with a fancy accessory. 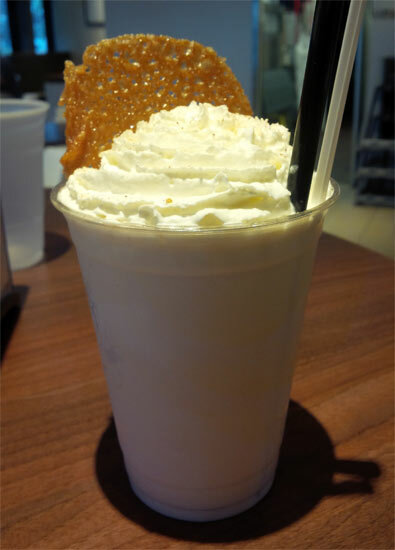 It's definitely something I'd get again on its own (if it ever returns) but I'd love more to be in the actual shake and not only sprinkled in the whipped cream as well. All and all, my first trip to Burger 21 was a success. Next trip, I'm thinking about trying the ahi tuna burger, sweet potato fries and their s'mores shake. How does that sound to you guys? What burger/shake/sauce would you want to try the most? That chocolate malted milk ball shake has my attention as well. Baklava is made with filo dough (puff pastry equivalent) but it's also layered with nuts and honey. Sweet potato fries all the way! Baklava (/ˈbɑːkləvɑː/, /bɑːkləˈvɑː/, or /bəˈklɑːvə/; Ottoman Turkish: باقلوا [bɑːklɑvɑː]) is a Middle-Eastern dessert. It is a rich, sweet pastry made of layers of filo filled with chopped nuts and sweetened and held together with syrup or honey. It is characteristic of the cuisines of the former Ottoman Empire, and is also found in Central Asian, Middle Eastern and Southwest Asian cuisines. wiki, points for making your name the link to the wikipedia entry. I know that it wasn't actually baklava in my shake but I've never had the actual dessert to compare it to. Sophia, yeah I need to try the real dessert to be able to tell how similar the two are. As is, it is still quite tasty and I'd eat hose disks for days. mm yes, definitely sweet potato fries because sp fries >>> wp frie ;) i LOVE baklava and this shake sounds delicious! can't wait to hear about their s'mores version!